HIGH-RESOLUTION IMAGES FOR EDITORIAL COVERAGE, B-ROLL, PRESS RELEASE, AND FACT SHEETS FOR ROAD TO BERLIN. 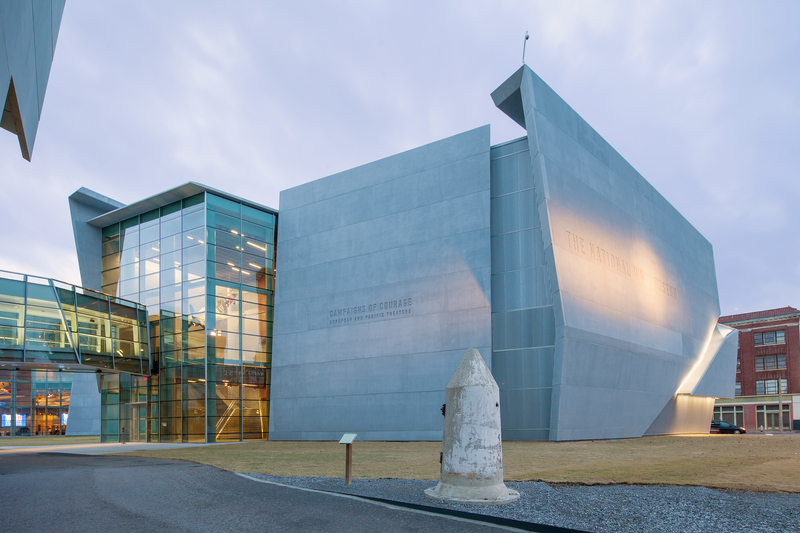 Campaigns of Courage: European and Pacific Theaters, the newest pavilion on the campus of The National WWII Museum in New Orleans, opened December 13, 2014, with the dedication of its first-floor exhibition: Road to Berlin: European Theater Galleries. Road to Tokyo: Pacific Theater Gallerieswill open on the second floor in December 2015. The introductory gallery in The National WWII Museum’s Road to Berlin: European Theater Galleries sets the stage for the narrative to come, laying out the war's key challenges through period videos, an overview of leaders and strategy, and an atmospheric gallery evocative of the North African region where American engagement began. 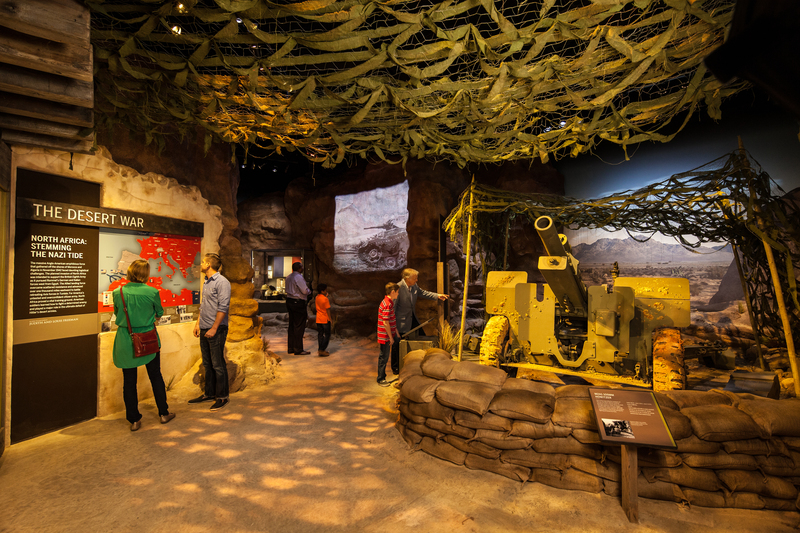 Within The National WWII Museum’s Road to Berlin: European Theater Galleries, The Desert War gallery takes visitors into Northern Africa—a strategic first front that proved a valuable training ground for inexperienced citizen soldiers. Front and center is the M2A1 105mm Howitzer that became an invaluable artillery asset. 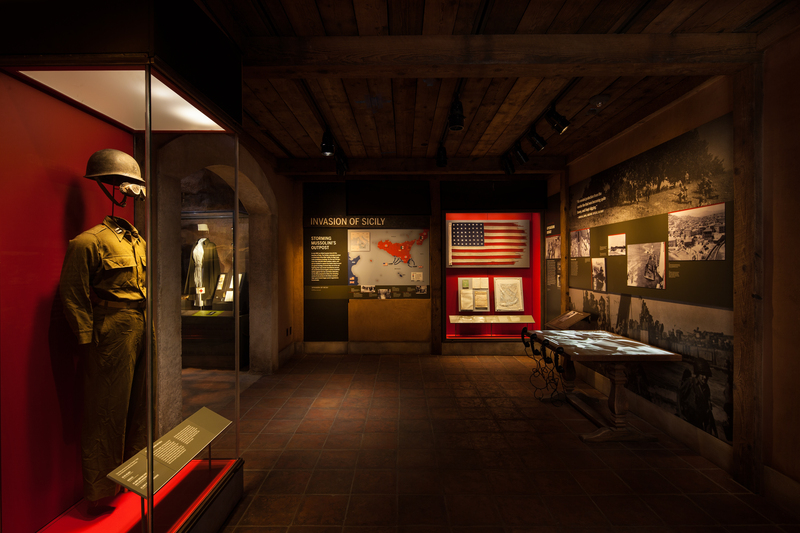 Within The National WWII Museum’s Road to Berlin: European Theater Galleries, a wood-beamed Sicilian villa is filled with sights, sounds, and artifacts of the Allies' conquest of Palermo and advance toward Italy. Although this first Allied liberation of an Axis capital city was a piercing blow to the “soft underbelly” of Axis Europe, bitter rivalries among Allied leaders and a horrific friendly fire accident showed that citizen soldiers were still not a polished fighting force. 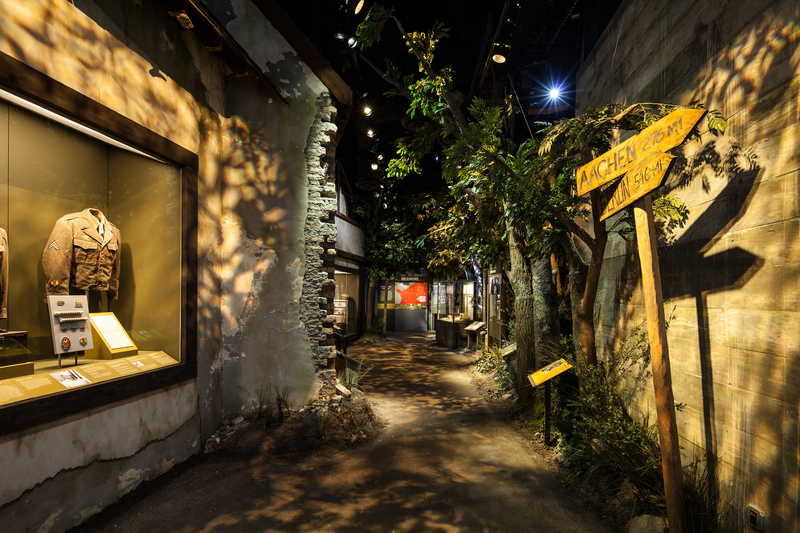 Surrounded by the recreated walls of an Italian village, The National WWII Museum’s Road to Berlin: European Theater Galleries takes visitors into Axis Italy. 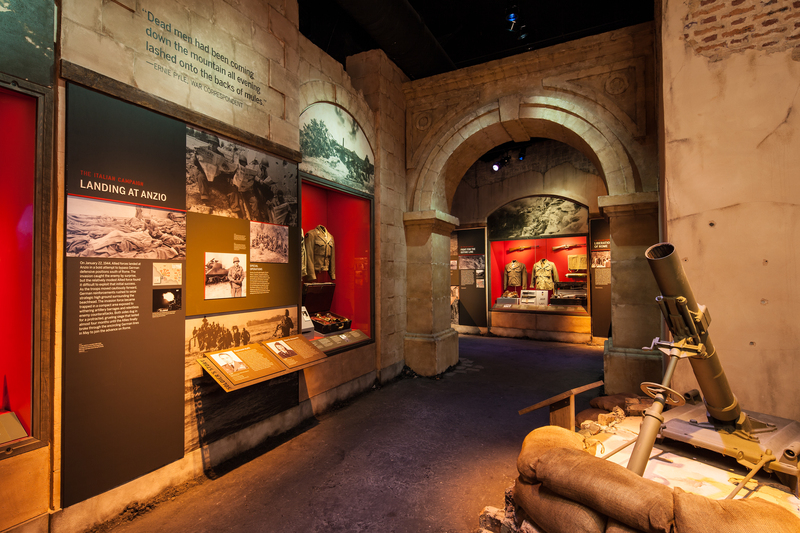 With personal narratives, poignant artifacts, and audio & video elements, The Italian Campaign Gallery tells the story of a country surrendered by its citizens only to be flooded with Nazi troops unwilling to cede Axis territory—and the 20-month war of attrition that the Allies endured on their way into Europe. 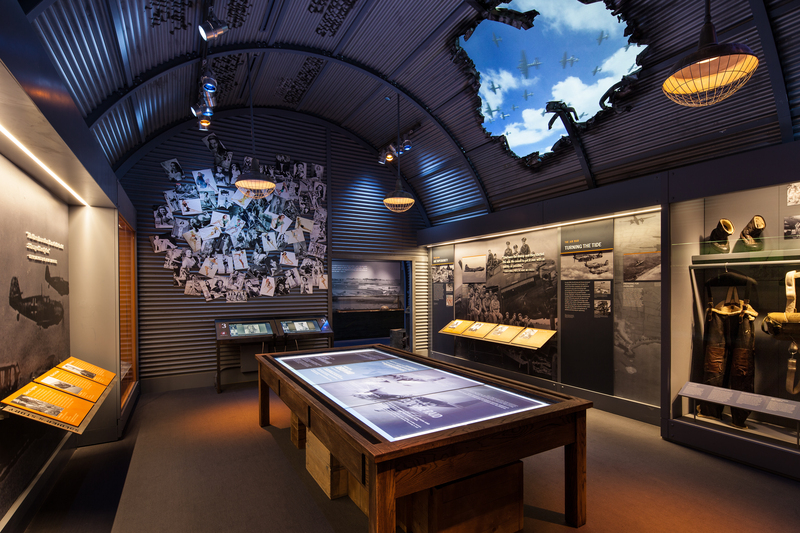 A captivating interactive table—part virtual mission briefing, part aircraft guide, part flight simulator—is the highlight of the Air War Gallery in The National WWII Museum's Road to Berlin: European Theater Galleries. On surrounding walls, displays of photographs, artifacts, and a nostalgic cluster of pinups complete the picture of daily life for America's Bomber Boys, as planes overhead—seen through a bomb-torn corrugate roof—fly by in a continual video feed. 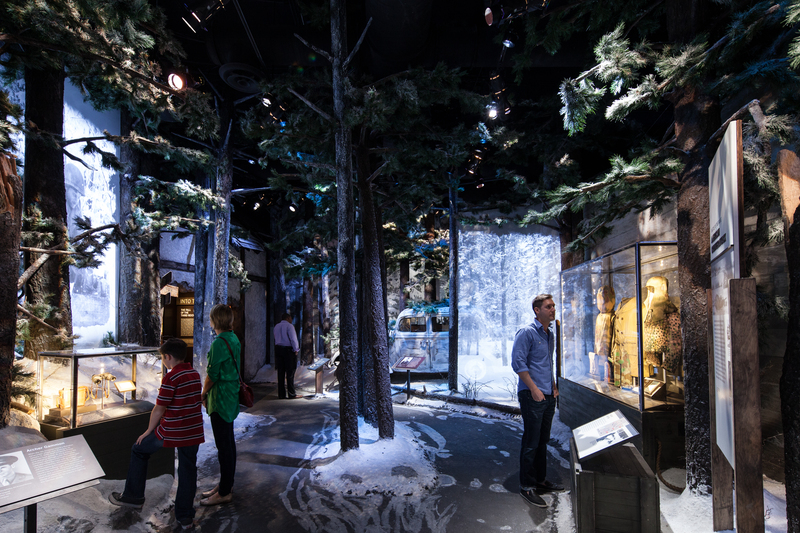 The Northwestern Europe gallery in The National WWII Museum's Road to Berlin: European Theater Galleries describes what came after D-Day: Highlighted here are the challenging terrain and impenetrable hedgerows that would put American ingenuity to the test. The exhibition's focus on individual stories is represented in a collection of oral histories and fascinating artifacts—such as the stolen German typewriter (center) on which a young member of the French Resistance transcribed the BBC broadcasts she illegally intercepted. 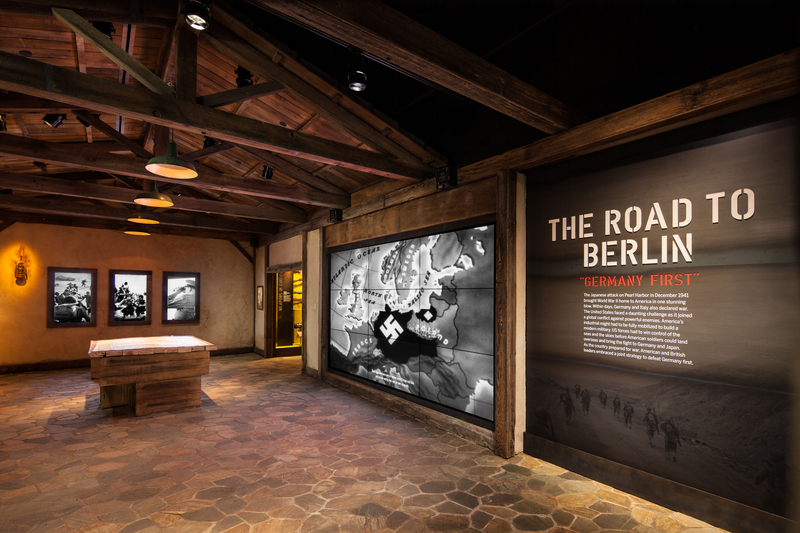 The Northwestern Europe gallery in The National WWII Museum's Road to Berlin: European Theater Galleries describes what came after D-Day—including logistical and supply-line challenges and immense obstacles such as Hitler’s Siegfried Line, which blocked Allied progress and prompted the ill-fated Operation Market-Garden. The city of Aachen (indicated by the directional sign at right) was part of this daunting line of Axis defenses, eventually falling victim to the Allied advance with a heavy toll of destruction. 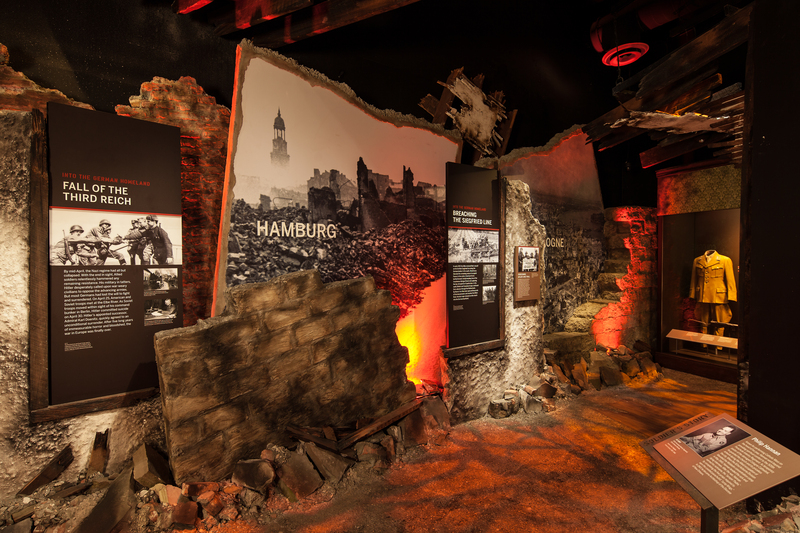 With stunning realism, this gallery in The National WWII Museum's Road to Berlin: European Theater Galleries recreates a bunker along the Siegfried Line, complete with walls scrawled with sightfinding notes, German-language warnings to soldiers, and the graffiti of the American troops who discovered the abandoned structure. Between a video station for accessing first-person oral histories from veterans and a period video describing this moment in the war, a small peep hole gives a glimpse into the next frontier: The icy Ardennes. 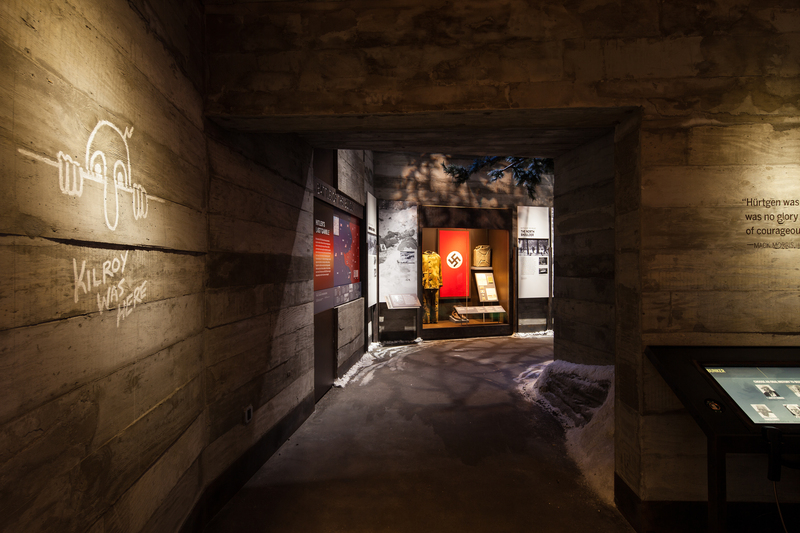 The Battle of the Bulge gallery within The National WWII Museum's Road to Berlin: European Theater Galleriesimmerses visitors in the frozen Ardennes forest, where citizen soldiers—caught off guard and without proper winter gear—defended their battered line against Hitler’s final surge. A large-scale dimensional video (left) and running audio of German and American voices evokes the chaos and danger of this costly battle, as visitors walk through the recreated forest toward a camouflaged Opel staff car, abandoned by the German army. 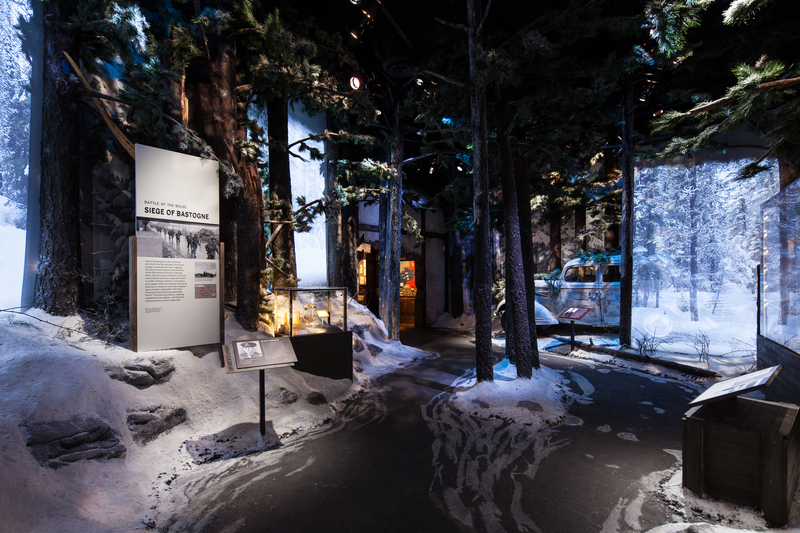 The Battle of the Bulge gallery within The National WWII Museum's Road to Berlin: European Theater Galleriesimmerses visitors in the frozen Ardennes forest, where citizen soldiers—caught off guard and without proper winter gear—defended their battered line against Hitler’s final surge. 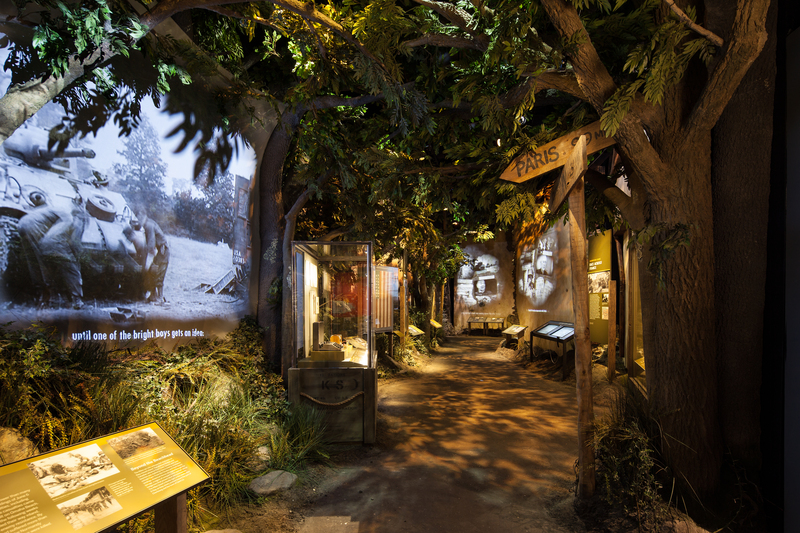 A large-scale dimensional video (left) and running audio of German and American voices evokes the chaos and danger of this costly battle, as visitors progress through the recreated forest toward a camouflaged Opel staff car, abandoned by the German army. The final gallery in The National WWII Museum's Road to Berlin: European Theater Galleries, the Into the German Homeland gallery evokes the devastation that characterized German cities—and cities across Europe—as soldiers entered the German capital. Glowing embers punctuate disjointed walls and charred rubble, providing a fittingly solemn backdrop for the conclusion of the European Campaign and a contemplative look at the costs and lessons of war.